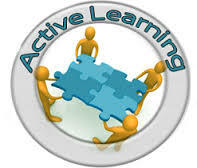 Active learners accept much of the responsibility for learning. Active learners understand that the responsibility for learning must come from within, while passive learners often want to blame others for their lack of motivation, poor performance, time-management problems, and other difficulties that thy might experience. When active learners don’t perform as well as they’d hoped, they evaluate why they didn’t do well, and change those studying behaviors the next time. Passive learners, on the other hand, often approach every course in the same manner and then get angry with professors when their performance is poor. It is only when students accept the responsibility for their own learning that they can truly be called active learners. Active learners question information that they read and hear, while passive learners accept both the printed page and the words of their professors as “truth”. Active learners don’t question everything, but they do evaluate what they read and hear. When new information fails to “fit in” with what they already know, they may differ in the conclusions they draw or in the inferences they make.